Occasion: Fall, Winter , Daily , Work , Vaction Wear. Fulfilled By FBA: Prime Shiping Choose. Fulfilled By Merchant: 5-14 days Shipping. S US (4-6) Chest: 38.6 Inches, Length: 28.3 Inches. M US (8-10) Chest: 40.6 Inches, Length: 28.7 Inches. L US (12-14) Chest: 41.3 Inches, Length: 29.1 Inches. XL US (14-16) Chest: 43.3 Inches, Length: 29.5 Inches. Quarter Zip, Soft and Fuzzy. If You Have Any Question ,Please Feel Free To Leave Customer Questions & Answers. The photos of models from our store Spadehill is Original Apparel. ATTRACTIVE LOOK - This Pullover is Asking For Your Love and You Will be Powerless to Resist It's Charms! 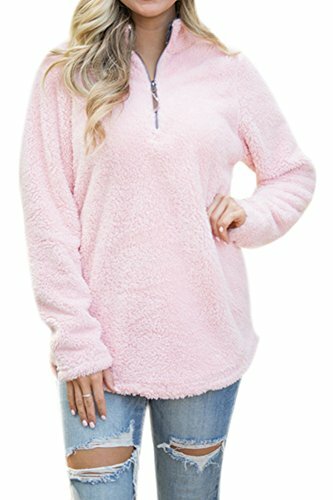 This Gorgeous Pullover is Such a Must-have for Fall and Winter! SIZE INFORTMATION - S (US 4-6), M (US 8-10), L (US 12-14), XL (US 16-18). Detail Refer to Sizes in Product Description as Below. FLEECE PULLOVER - This Quarter Zip Pullover Has Pockets on Each Side, and A Rounded Hemline for A Stylish Combination! It Features Amazingly Soft and Fuzzy Outer Material and The Interior Lining Feels Almost as Amazing as The Outside! 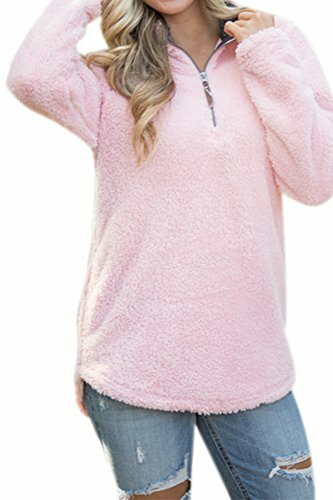 You'll Love Snuggling Up in This Gorgeous Pullover All Season Long! CASUAL CLOTHING - It's so Effortlessly Easy to Throw This on Over Your Favorite Long Sleeve Tees, Pullovers, and Graphic Tees! Just Add Distressed Jeans and Stylish Boots for The Complete Look! 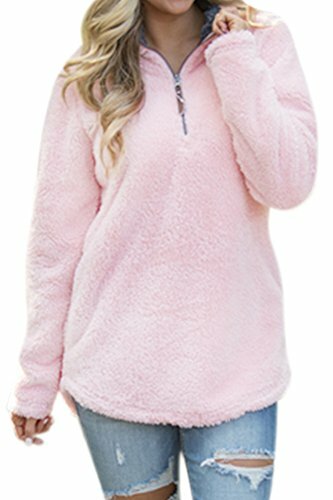 CUSTOMERS COMMENT - "I didn't want to take off this amazing pullover, incredibly soft and snuggly!! The color is so adorable. One of my favorite Top! Will be perfect for cold weather. I wore it with black skinny jean and short tan fringe booties! It is great to wear every day for any occasion. Looking forward to wear it more in the fall or winter!" If you have any questions about this product by Spadehill, contact us by completing and submitting the form below. If you are looking for a specif part number, please include it with your message.